On the 18th February, this site was suspended due to threats by Holocaust fanatics. This site will be re-launched on 22nd February 2010 and will no longer be hosting databases associated with the Holocaust or World War Two until further notice. We are currently accepting requests for databases related to significant historical events that occurred during World War One. We would like to take the opportunity to thank all contributors to the project to date. Two Holocaust fanatics, Mr. Roberto Muehlenkamp and Mr.Sergy Romanov have apparently been attempting to derail this project by fraudulently claiming that it is a Holocaust denial website. They have never been associated with, nor contributed to this project. They have based their criticisms on the contributions of others and ignored the stated goals of this project. Sensitive information and photographs were obtained by hacking a private Gmail account belonging to a web-designer who was attempting to generate interest I the project. This information was subsequently used to threaten our contributors and my family personally. It is a shame that certain elements within society resort to such tactics to achieve their ends, destroying the good work of other in the process. As a side note, it's interesting how these claims mirror the claims of another mentally unbalanced person - Carmelo Lisciotto (of holocaustresearchproject.org) - who through a series of fake blogs tries to spread rumors that me and Nick hacked deathcamps.org because apparently we're closet Holocaust deniers (for the real story behind deathcamps.org demise click here). All these internet loons have poor fantasy and a single old playbook, just changing the sign as necessary (Holocaust deniers/Holocaust fanatics). Anyway, no, nobody of us had any relation to the alleged hacking of any email, and we doubt that any email was hacked in the first place (this is a mere unfounded claim by a person who lies as he breathes). But yes, information about the person behind that site was obtained after he legally threatened the members of RODOH and RODOH itself for something he didn't like (i.e. people calling him an antisemite). We don't like frivolous legal threats coming from semi-anonymous a-holes, so we decided to take a look at what Google had in store. Tracking down the owner's information was ridiculously easy since he was very stupid by sharing it with everybody. 1. His Facebook page had publicly accessible photos of him and his family, though under an assumed surname (which he had used at RODOH and elsewhere). 2. He tested the first version of HRSDB on the site he created for his son (what kind of person does that?). Although he deleted it, the Google cache still shows numerous traces even as I write this text (Google cache is temporary, but it lasts for some time; in any case we've taken screenshots). 3. The public domain name registration records of various sites confirmed his identity. So after numerous legal threats issued by this person right and left, and after he created a libelous website about Roberto with the threat of exposing "everything" about Roberto and his private life ("You see, as you are obviously such a special person, the world really should know EVERYTHING there is to know about you, your views and your personal life. I intend to go DEEEEEEEEEEEEEEEEEP buddy. Real deep. "), I suggested to him that I might also expose this collected information, especially to the local police of the city he now resides in the country where Holocaust denial and antisemitic propaganda are illegal. That was the extent of the "threats" mentioned in the disclaimer. So Richard is just being hypocritical. As to the claims about that website being fraudulent, see this article by Jonathan and decide for yourself. I suggested to him that I might also expose this collected information, especially to the local police of the city he now resides in the country where Holocaust denial and antisemitic propaganda are illegal. I wouldn't do that, as it's against our principles. After all we strongly disapprove of laws against Holocaust denial. Whoever asserts or disseminates a fact in relation to another, which is capable of maligning him or disparaging him in the public opinion, shall, if this fact is not demonstrably true, be punished with imprisonment for not more than one year or a fine and, if the act was committed publicly or through the dissemination of writings (Section 11 subsection (3)), with imprisonment for not more than two years or a fine. Whoever, against his better judgment, asserts or disseminates an untrue fact in relation to another, which maligns him or disparages him in the public opinion or is capable of endangering his credit, shall be punished with imprisonment for not more than two years or a fine, and, if the act was committed publicly, in a meeting or through dissemination of writings (Section 11 subsection (3)), with imprisonment for not more than five years or a fine. The fellow is obviously making claims against better judgment and therefore guilty of defamation. And he's doing it in writing. If the fellow is so deluded and paranoid as to believe his own BS, he may be granted the benefit of applying only the provision for malicious gossip. Assuming he's not so barking mad that he cannot be held criminally responsible for his actions, that is. In that case he should be locked away in a nuthouse. > I wouldn't do that, as it's against our principles. After all we strongly disapprove of laws against Holocaust denial. What Richard intends to do will rather benefit opponents of the "Revisionist" faith by putting at their disposal a handy collection of eyewitness accounts and other material about Treblinka. 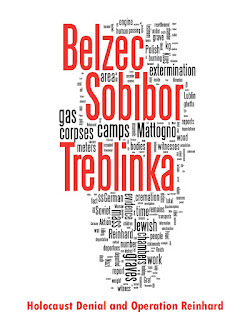 Absence of distortions provided, I may find things there to add to my collection of Treblinka eyewitness accounts, for instance. In this sense, Richard's work may well become a shot in the foot of "Revisionism", similar to those of Messrs. Krege and Mattogno. So please keep it up, Richard! We don't want you to shut down or change the subject of your database, loony. 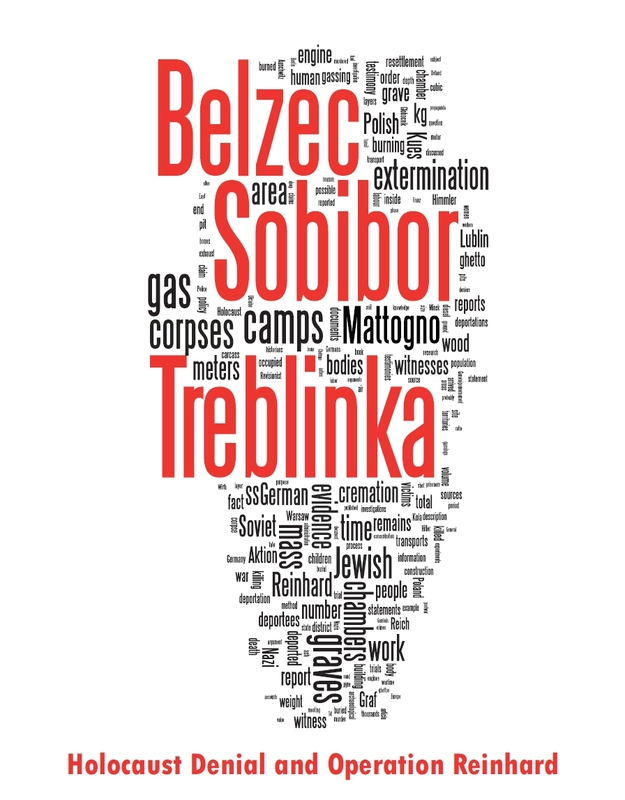 We want you to collect lots of Treblinka eyewitness accounts and other Treblinka material and make it available online for free. Your work will be greatly appreciated.